A five-year trial from the University of Michigan Injury Center appears to have found an effective means of discouraging youth from risky drinking behaviors. The study determined that a short intervention during emergency room visits—regardless of cause—could decrease underage alcohol consumption and associated problems over the next year. Over the five-year period, 4,389 medically stable patients between the ages of 14 and 20 were screened for risky drinking behavior when they visited the emergency room for any reason. Of this number, 1,054 (24%) reported risky drinking and 836 were enrolled in the trial. The participants were randomly assigned to a control group or to short counseling delivered by either a therapist or an interactive computer program. Follow-up visits were arranged at the three-, six-, and 12-month periods to monitor progress. The patients who received interventions reported significant reduction in drinking during the follow-up periods. They also reported a sharp decrease in experiencing alcohol-related consequences, along with prescription drug abuse. Of particular interest is the fact that these results were present regardless of whether a therapist or computer intervention was used. This provides a promising avenue for further exploration, as the ability to create a stand-alone, automated intervention program would afford a much easier method of future implementation. Injury Center director Rebecca Cunningham notes that the study highlights the benefits emergency room interventions can bring to efforts to combat underage drinking, but more work remains to be done. Assessment of whether the effects of the study persist for longer than one year need to be made, along with exploring different means of delivering the interventions. The computer program used on this occasion, for instance, is referred to by the study authors as “Facebook-style” and it is unclear if more effective methods are available. Along with the University of Michigan Injury Center, the study was conducted alongside the U-M Emergency Department and the U-M Department of Psychiatry. The trial was funded by the National Institute on Alcoholism and Alcohol Abuse and has been published in the medical journal Pediatrics. According to the Centers for Disease Control and Prevention (CDC), alcohol is the most commonly abused drug among American youth and results in more than 4,300 deaths each year. In addition to the school, social, and legal problems that can develop from underage drinking, other known consequences are an increase in unwanted or unplanned sexual activity, higher suicide and homicide risks, risk of death from alcohol poisoning, and the disruption of physical and sexual growth. As a 2013 study notes, 8.7 million youth between the ages of 12 and 20 reported drinking within the past month. Although, compared to adults, youth consume less alcohol overall (youth are responsible for about 11% of all alcohol consumption), they are also more likely to binge drink. In fact, almost 90% of alcohol consumed by youth is in the form of binge drinking, defined as having five or more drinks during a single occasion. Youth who begin drinking before age 15 are also five times more likely to become alcoholics later in life when compared to those who begin drinking at or after age 21. Cunningham, R., et al., “Alcohol Interventions Among Underage Drinkers in the ED: A Randomized Controlled Trial,” Pediatrics 2015, doi:10.1542/peds.2015-1260. 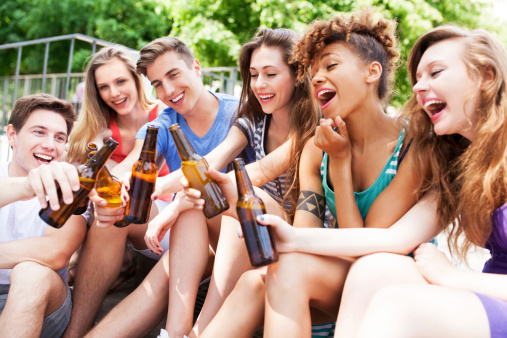 “Emergency Department Visit Provides Opportunity to Reduce Underage Drinking,” University of Michigan Health System web site, September 23, 2015; http://www.uofmhealth.org/news/archive/201509/emergency-visit-provides-opportunity-reduce-underage-drinking. “Fact Sheets – Underage Drinking,” Centers for Disease Control and Prevention web site, last updated October 31, 2014; http://www.cdc.gov/alcohol/fact-sheets/underage-drinking.htm, last accessed October 7, 2015. “Underage Drinking,” National Institute of Alcohol Abuse and Alcoholism web site, http://pubs.niaaa.nih.gov/publications/UnderageDrinking/UnderageFact.htm, last accessed October 7, 2015.